Reasons for Decline of the Gupta Empire: The Gupta Empire was named after the Gupta dynasty which ruled approximately between 320- 550 CE. The Gupta dynasty period is regarded as the Golden Age of India. The reasons for the fall of the Gupta Empire were both external and internal factors. The external factors were the continuous attempts of invading the mighty Gupta kingdom by the White Huns, Vakatakas and other emerging kingdoms. Skandagupta was regarded as the last great ruler of the Gupta Empire. However, the threats of invasion had begun during the reign of Kumaragupta I. The Pushyamitra tribe had made several unsuccessful attempts to invade the Gupta Empire but was every time defeated by the capable Gupta Empire leader, Kumaragupta. During the reign of Skandagupta, the Huns tried repeatedly to conquer the Gupta Empire territories but were defeated by Skandagupta. However, the successors of Skandagupta were weak and could not control the vast Empire. The invasion of the Gupta Empire by the Huns or the White Huns was one of the main reasons for the decline of this mighty Empire. The Huns were successful in invading the Gupta Empire after the death of Skandagupta. The Huns were able to conquer many provinces of the Gupta Empire like the Malwa, Gujarat, and Thanesar. It is said that despite their continuously declining power the Gupta’s managed to fight the Huns for some time and thus prevented the enemy from taking over their Empire. 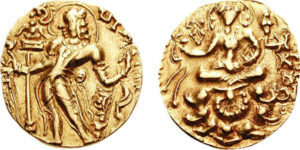 Narasimha Gupta of the Gupta dynasty formed an alliance with the independent kingdoms to avert the Huns from entering the northern Indian regions. The smooth functioning of the Gupta Empire was severely affected by Yasodharman, the Malwa prince. The reign of Yasodharman did not last for a long but it certainly challenged the Gupta authority and power. The Gupta Empire also suffered because of the invasion attempts made by Toramana and his successor Mihirakula. The Gupta Empire was affected by the expansion of the Vakataka kingdom. The management and control of the Gupta Empire were also seriously affected by the widespread unrest within the kingdom. Some states had declared their sovereignty owing to the inability of the Gupta rulers to control the vast territories of the empire. These were the factors that led to the decline of the vast and powerful Gupta Empire.